By switching focus from the Cherry Creek district to Eagle Butte it is possible to offer some photographs of people. This is due to the fact that there are more photographs in general from the other districts than for the Cherry Creek district. Also, apparently people were more cooperative with the survey takers and photographer–no, I do not know the identities of these government employees for the 1922 survey. According to the survey Bad Warrior had sold some land. I think the house itself speaks to the issue of prosperity. And in an attempt to address certain potential questions–hunger often prompted the slaughter of cattle before the time deemed appropriate by the district’s Head Farmer. Head Farmers were White men who were put in charge of teaching White agricultural and cattle raising practices to Indian people. But this was not the beginning nor the end of the scope of the Head Farmers’ duties–one might consider them the social/cultural/legal enforcement authorities of assimilation policy. Many of them made it their business to know, in order to control, every aspect of the lives of the Indian Wards of the Government. Some were good people—and others were not so decent. All materials are in the public domain from the National Archives in Kansas City, MO. 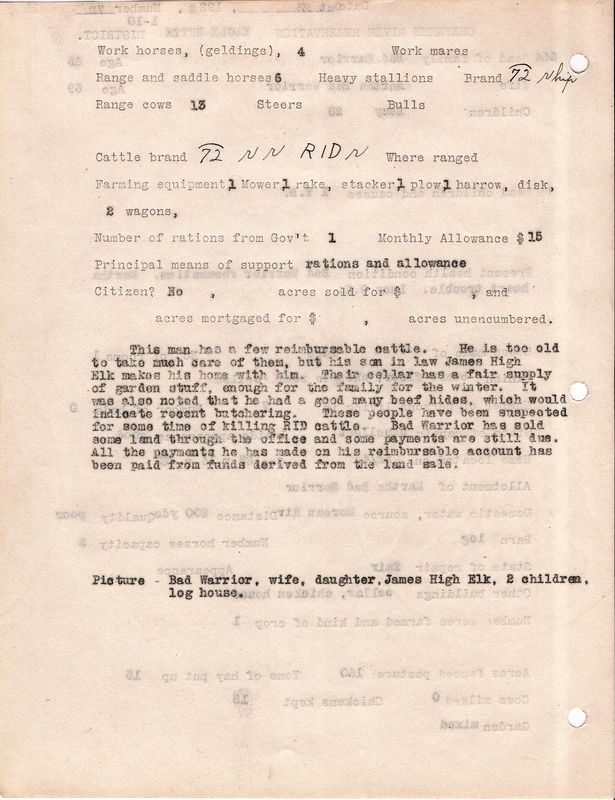 Documents are from Record Group 75. These documents are posted in order to make them available to people who would not otherwise have access to them. They are posted with much respect for the people represented. This information is also presented in order to educate and inform others about the living conditions on the Cheyenne River Indian Reservation in 1922, South Dakota. 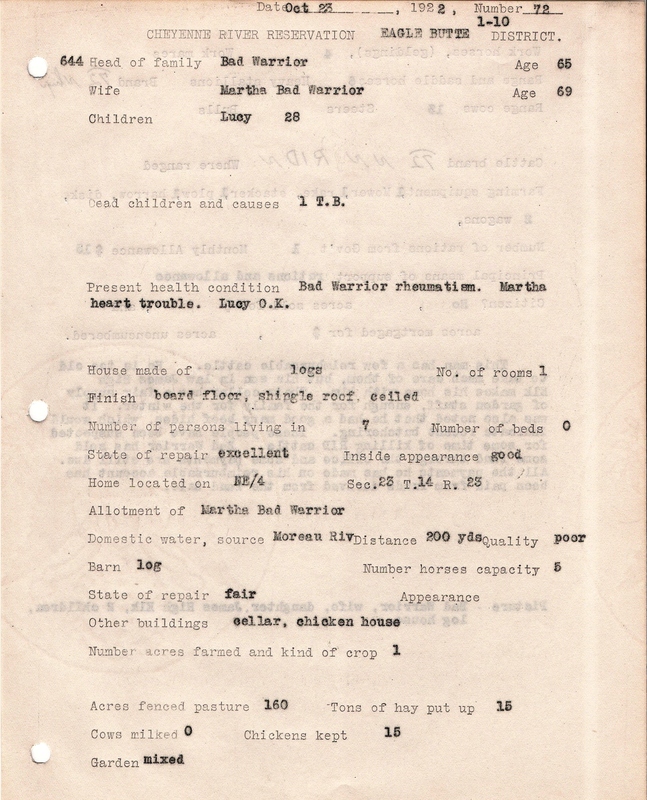 This ‘page’ is from a survey/census done on the Cheyenne River Indian Reservation in 1922. There is an entry for every family on the reservation–a narrative and a statistical page. There are not many photographs of the people from the Cherry Creek District–but there are for Promise, Whitehorse, LaPlant, Thunder Butte, Eagle Butte, and the Agency Districts. The amazing thing is the incredible detail quality of the small snapshots when enlarged to 11 x15. 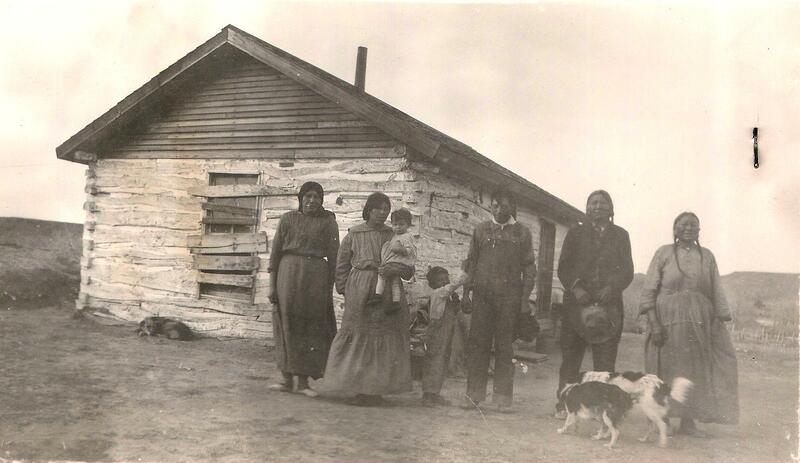 Not all the photos are well executed, but those that were are quite full of wonderful detail that capture so much more than I suspect the photographer had in mind with this project to record the living conditions of the people on the reservation.